I can’t tell you how many times I’ve looked at the clothes in my closet and just stood there waiting for inspiration to strike me. In my mind, I know I’ve built a wardrobe of pieces I love that are able to be mixed together in new and interesting ways, but at a certain point, I’ll get stuck in a fashion rut where I’m wearing the same outfits over and over again. I don’t mind repeating outfits—and I actually encourage it—but I inevitably get bored of duplicating the same looks too many times. At that point, I’ll pull out my phone and thumb through Instagram and Pinterest and the screenshots I’ve taken to give myself a much-needed dose of inspiration. It always amazes me how looking at some fresh outfit ideas allows me to reimagine the pieces I already own and style them in ways I would never have thought of by just standing in my closet. 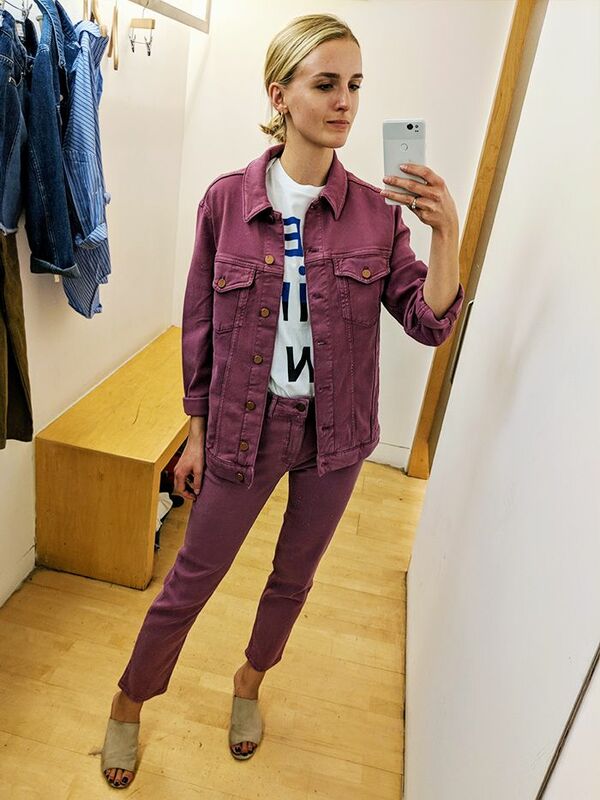 If you similarly get bored of your standby looks, I’ve put together an edit of 93 new outfit ideas to try for yourself. Ahead, they’re broken down by category so you can scroll through to find inspiration for whatever you’re in the mood to wear—whether it’s an outfit with sneakers or heels, something for the office, the perfect wedding guest look, or anything in between. We’ve named Emili Sindlev the master of bright colours because she knows how to pull them off so well. Her outfits are a treasure trove for bold colour ideas. Purple and green are a winning combo. Who knew? Same goes for purple and yellow, apparently. Throw on a matching blazer with your pants. Yep, it just always looks good. See, this is clearly a fashion-girl secret. You can always try sticking to one neutral colour for pants and accessories, and then adding in a pastel shade on the top. Or copy one of my new favourite outfits with wide-leg pants and a square-neck top. Make jeans and a T-shirt feel more special by layering a corset on top. For winter, you can keep things both stylish and comfortable by adding a puffer jacket and chunky trainers. This outfit is less about the jeans and more about the statement top. If you’re not into blue denim, try white. But also consider coloured denim like head-to-toe red. This boot height can be tricky to style, but here is the perfect way. White on white never looked so good. Combat boots and a miniskirt. We’re in. Minimal on the top, and colourful on the bottom. Add strainers to a dress you’d normally pair with heels. Why just wear sandals with your summer dresses? Fashion girls have a thing for Birkenstocks. Add your loafers to a miniskirt outfit. Very into the pointed-toe flats here. Tracksuits, please and thank you. High-waisted tracksuits for the win. Nailing athleisure in a nutshell. With hoodies these days, bigger is better. Or just a skirt that’s really pretty. Go for something classic yet modern. Or a matching two-piece set. We’re so here for minis. If you want something comfortable, go for kitten heels. Satin tracksuits go nicely with heels. Same goes for vinyl pants. Strappy sandals are giving this outfit ’90s vibes. Mix unexpected prints and textures. Pile on the hat and jewelry. And when it comes to hats, make them oversized. There’s nothing more retro than a high-waisted bikini. Style a long dress with flip-flops if you’re on board with the trend. Or slingback heels for a more classic look. Minidresses and lace-up heels make for the perfect holiday outfit formula. Throw on a statement jacket. Block heels make this perfect for a city outfit. You can’t beat a comfortable travel outfit with sneakers and athleisure. Matching pantsuits look both professional and stylish. Try pairing one with ankle boots. Or go for something less traditional like plaid flared trousers. Try out a suiting-inspired skirt and top with strappy heels. Instead of trousers, wear a belted dress. Another cool option? An ’80s-inspired top and skirt. Pretty floral dresses never fail. Same goes for micro minidresses. The weekend is the perfect time for a cool crop top. You can also try tying a button-down instead of wearing a crop top. A puffer jacket and a leopard-print pant outfit is the unexpected winter look everyone needs. Take the puffer jacket to the next level. Here’s a way to incorporate the cowboy boot trend. Speaking of trends, here’s how to pull off oversized outerwear. The puff sleeves balance out the fitted skirt. A boat outfit that doesn’t involve a swimsuit. Show up in something colourful. Go for a floor-sweeping dress. This is definitely an outfit I’ll be repeating. Bike shorts never looked so good. Now this is how to pull off neutrals. Making a case for lime green. If you’re really into blue denim. Nouveau milkmaid tops are still going strong. Puff sleeves aren’t quitting anytime soon either. Add a polka-dot top to high-waisted trousers. Here’s how to wear two of fall’s big trends—leopard and tartan—at the same time. Top off neutrals with some colour. With prints, go big or go home. This is how to wear black, but make it interesting. Next: shop the 9 new-in pieces we are loving this week.